Two middle school students were struck by a vehicle while on their way to Talbot Middle School in Fall River this past Monday. This auto-pedestrian accident occurred when the girls were using a crosswalk with a crossing guard present on Eastern Ave. near County Street. One of the girls has reportedly been hospitalized having sustained serious injuries, and the other has been hospitalized with minor injuries. Fall River Superintendent Matthew Malone released a statement acknowledging the accident and ongoing investigation. Distracted driving – This one tops the list as usual. Many people can’t sit in traffic without whipping out the smartphone to return texts, surf the internet, or to try to multitask and take care of business. Speeding – Many drivers drive through school zones without slowing down to the posted speed limit. When a driver is going too fast in a school zone or around school, it becomes more difficult for a car to come to a stop for students. Unsafe drop-off/pick-up behavior – With so many parents and guardians trying to get in, find a spot or double park, grab their children and get out, it can lead to potential disaster. Inner city school zones – School zones in cities like New Bedford, Fall River and Providence can be more dangerous because there isn’t always room for a safe pick-up drop-off area. Because of this, parents tend to double park causing more backed up traffic and more confusion. Let’s face it, kids aren’t always aware of the rules involved in crossing the street or safe practices to reduce their risk of being in an auto-pedestrian accident. For these reason, we would like parents to review the below safety tips with their children in an effort to reduce their child’s chance of being in a pedestrian school zone accident. 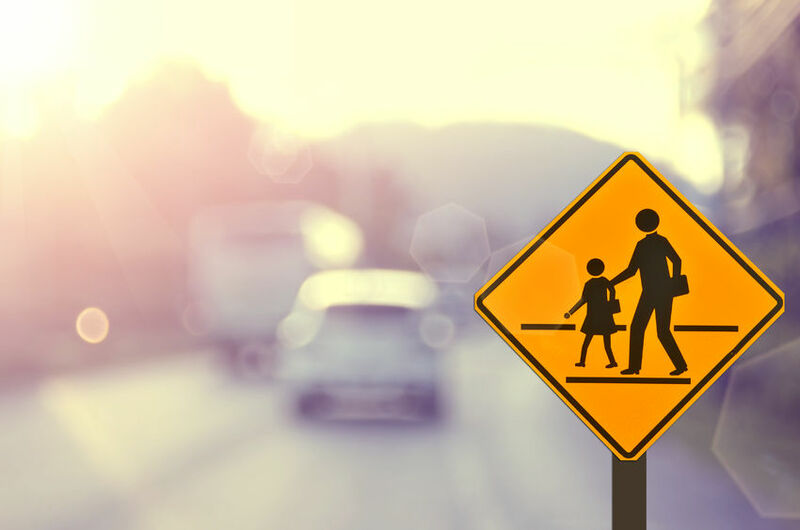 Look and use caution when crossing – Remind your children to look left, right and then left again before stepping off of a curb to cross a street, and just because the “Walk” signal is illuminated does not mean the street is completely safe. Be aware / Drop the distraction – Parents need to reinforce the message that cell phones and headphones should be put down when crossing the street. Stick to the sidewalks – When children are walking in the roadway, the chances of an auto-pedestrian accident increase. Use sidewalks when they available, and try to walk facing traffic as far to the left side as possible when there are no sidewalks. Walk with your kids – According to safekids.org, most children under the age of 10 cannot judge the speed and distance of an oncoming car. This means that children age 10 and under should be walking with an adult. Lead by example – Parents and guardians should be setting a good example by heeding all of these same traffic rules and putting down their devices while walking. If you or a family member have been left with injuries in a car accident, please contact us to speak with an experienced attorney. Dussault & Zatir P.C. has lawyers on call at +1-800-542-4LAW to answer your personal injury questions. With offices in New Bedford, Fall River and Taunton, Massachusetts, as well as an office in Providence, Rhode Island, if you’ve been injured, our lawyers are here to fight for you.